This is G o o g l e's cache of http://forum.bustalk.net/index.php?PHPSESSID=8a09f15ebbd0caf3d442f193557ce950&topic=1522.50 as retrieved on Mar 12, 2007 01:43:10 GMT. The fact that the drivers are getting assaulted on a constant basis is absolutely disgusting. Its time they make employee assaults a felony just like they did here for protection of the MTA workers. A wildcat strike could lead to better conditions for the bus operators, they already face enough stress from just doing their jobs and shouldn't also have to constantly thikn they may be the nect victim of a beating. I totally agree, I expected to have a lot of people mad at me when I went back, I was actually quiet surprised how pleasant a lot of them were and the support from them. The head of the transit workers' union should resign over Monday's wildcat strike, a TTC commissioner says. Councillor Bill Saundercook called for Amalgamated Transit Union president Bob Kinnear's immediate resignation yesterday, saying he had held the city hostage. "Mr. Kinnear shut down a lot of valuable rolling stock that belongs to everyone in Toronto," Saundercook said from Saskatoon, where he's attending a transit conference. "He did it illegally and intentionally. I think he has to pay the ultimate price for that." Kinnear laughed off the demand. "Tell him to put in an application to the TTC as an operator," Kinnear said. "He can go out there and can drive a bus for six or seven months, get kicked, punched and spat upon, and then he can vote me out." Just people paying the fare and getting on with their lives. That was the scene at most stops, yesterday morning, as throngs of commuters boarded public transit without so much as a cross glare at TTC staffers. Some smiled and thanked the drivers — not what you might expect after a wildcat strike left 700,000 Torontonians without public transportation Monday. "I'm surprised at how patient people are," said Pete McCallum, as he drove along Eglinton Ave. with a smile on his face. "There's been no anger. I really was expecting some — quite rightfully so." Most riders said they were frustrated by what happened but stopped short of laying blame on TTC drivers. "I would never be upset with them, considering what they do and what they have to put up with," said Virginia Dos Reis, an interior designer, who spent $65 and hours getting to and from work Monday. "It's life. It happens," she said, despite calling the strike "worse than the blackout." Others weren't so willing to forgive and forget. Stephen Winbaum said he's lost trust in the TTC. "It seems like everyone's kind of nervous and jittery. If they did it yesterday, they might do it tomorrow," he said. Tensions were still running high at one stop yesterday when a man screamed through the open door of the 32D Eglinton bus stopped at Emmett Ave.
"Everyone lined up for the f------ bus," he yelled at the driver. "And they didn't even know you were on strike!" The bus driver, silent at first, soon tried to defend himself. "I know, I know," he responded. "It's not my fault." After a few seconds of banter back and forth, one passenger called on the driver to just drive away. "Today is another day," he told the angry man as he closed the doors. "See?" said the driver, Scott, who declined to give his last name. "That's the kind of reaction we get (sometimes)," he said, adding that one or two people refused to pay because they had to walk Monday. "If people knew the facts, they wouldn't be so hard on the drivers." TTC maintenance and mechanical workers walked off the job Monday and drivers refused to cross the picket lines, leaving commuters stranded for much of the day. Fred, a driver of 26 years, who wouldn't give his last name, said he didn't face any angry commuters during yesterday's morning rush hour on the King St. line. "I've had a few stares, but I think most people realize it's not the driver's fault," he said. People boarded the bus and exchanged hellos with him, moving silently as they took seats. Bobby Lowe has a few choice words to say to T.T.C. Chair Howard Moscoe. And not all of them may be printable. The man some are calling the ‘poster boy’ for the Amalgamated Transit Union’s war with management over driver safety came to the enemy’s City Hall camp Thursday, to confront the councillor over some of his alleged recent statements. Lowe was brutally attacked in a fare argument as he drove his bus two years, and has been on disability ever since. The union took out a full page ad in some local newspapers this week, spending $60,000 to make their point about driver safety. The campaign featured Lowe prominently and he claims Moscoe called him a liar about the suffering he endured and the compensation he had to fight for. The ad claims Lowe’s benefits were cancelled after his injuries and he was evicted from his apartment. And so on Thursday, the wounded man marched into the upper levels of City Hall, demanding to meet with his accuser. “Very angry,” he responds when asked how he’s feeling. “He sent us out there to do a job. It's like you sending a soldier on the battlefield, and when he get hurt, you left him lying on the field to fend for his own." The door closed on the pair for 10 minutes, and Moscoe emerged in a conciliatory mood. At least partially. “If I did, I shouldn’t have said it,” he admits about his alleged liar accusation. But he wasn’t about to let the union off the hook, after it staged an illegal wildcat walkout Monday that affected 800,000 people. And it turns out, not everything mentioned in the paid campaign was completely true. It says Lowe was cut off from Worker’s Comp. But those payments were only delayed by five months. The transit union wasn’t impressed when reporters pointed out the discrepancy. “He was cut off,” counters the A.T.U.’s Frank Grimaldi. But did it actually say he was cut off? he's asked again. It’s more evidence that the parties involved don’t much like each other. Neither has officially spoken to the other since Monday's illegal strike. And those sounds of silence have been reverberating very loudly ever since. Allegations made in a full-page ad placed by the transit workers union in yesterday's newspapers are false, TTC chairman Howard Moscoe said. 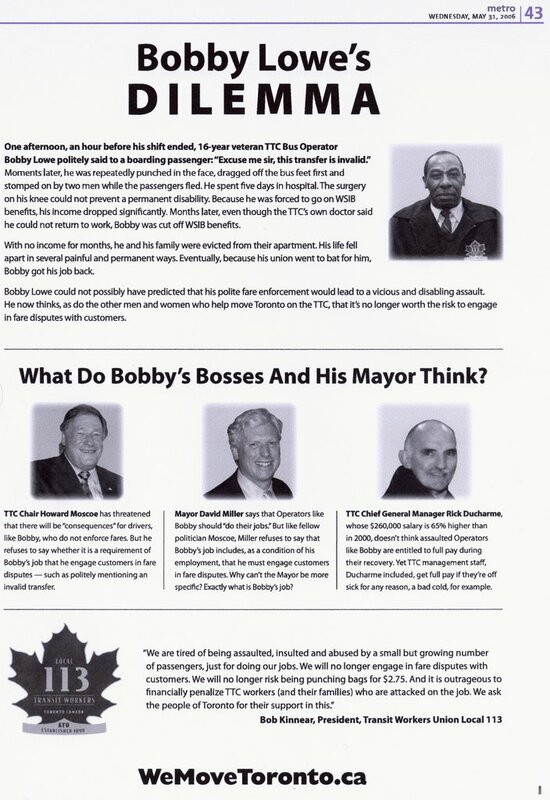 The ad seeks the support of the people of Toronto and highlights the case of bus driver Bobby Lowe, who was attacked more than two years ago for questioning the validity of a transfer. "Months later, even though the TTC's own doctor said he could not return to work, Bobby was cut off WSIB (Workplace Safety and Insurance Board) benefits," the ad reads. "With no income for months, he and his family were evicted from their apartment. His life fell apart in several painful and permanent ways." But a letter dated May 25 -- a day after Lowe was brought before the media last week to highlight the problem of driver assault on the TTC -- and addressed to the Amalgamated Transit Union Local 113 secretary-treasurer Les Moore said that the 16-year veteran was never cut off from benefits, and 10 days of claims that have not yet been paid are still under consideration by the WSIB. "While (Lowe) was at work, either his regular job or accommodated work, he was paid his full hourly operator rate," read the letter from Rick Ducharme, the TTC's chief general manager. "The ad is untruthful and the union was aware of the facts a week ago," Moscoe said. "This is their response and their response is basically a distortion of the facts." Local 113 president Bob Kinnear, whom a union spokesman said was unavailable all day for a response, also repeats in the ad demands that TTC workers assaulted on the job should be paid their full rate and not the 85% covered by the WSIB. "It is outrageous to financially penalize TTC workers who are attacked on the job," Kinnear said. But Moscoe said TTC employees are treated no differently than any other worker in Ontario who is injured on the job and that if the union wants pay packets for injured workers topped up, they should negotiate during collective bargaining. The issue did not come up at the table during talks that led to the April 2005 agreement that narrowly averted a strike, he said. Moscoe said he hasn't spoken to Kinnear since the illegal walkout Monday, preferring to leave the confrontation to official channels. He also said he isn't convinced the union's public relations effort is an attempt to get the public back onside. "The union doesn't seem to be able to focus on what the real issues are," he said. "They're as shifty as their ads." Meanwhile, a 22-year-old TTC rider was arrested last night after he allegedly spit on a bus driver who challenged him for not paying the full fare. Police said the incident took place at Kingston and Markham Rds. around 6 p.m. The rider was taken into custody and charged with assault. Exactly one week after a wildcat strike caused Monday T.T.C. closures and wreaked havoc on Toronto’s streets, residents of the city who ride The Rocket as well as those that drive it could be preparing for exactly the same thing. “You just hear a lot of talk going around,” said streetcar driver Faye Budree. The previous week’s one-day strike shut down all the transit systems throughout the Greater Toronto Area, leaving thousands of would-be passengers stranded and many of them equally furious. The issue stems in part from T.T.C. workers complaining of management not taking enough responsibility for their day-to-day safety. The problem of driver and employee safety is a real one, but responses and solutions have been slow to come. Understandably, this has led to aggravation on both sides of the debate. “There will always be frustration,” said a driver that asked not to be identified. Two court orders were needed to force transit employees back to work last Monday, and this time officials with the City of Toronto say they have a plan should another strike take effect at 12:01am Monday. “Our senior staff are going to be standing by going into work tonight if anything happens, and we’ll make sure we get a warning out if it does,” said T.T.C. Chair Howard Moscoe. Most workers and union representatives are keeping quiet about just how realistic a strike could be, but since any work stoppage would technically be illegal that should come as no surprise. Union head Bob Kinnear says he’s given no instructions to walk off the job to those he represents, but it’s happened before, meaning there’s no reason it can’t and won’t happen again. Adding injury to insult, there was another assault on a T.T.C. employee when a female driver was attacked around 5:30pm Sunday at Sheppard Avenue West and Sentinel, near Dufferin. The driver suffered scratches to her face and was allegedly spat on. Thankfully no weapons were used and officers are looking for two young female suspects. In my opinion, this speaks volumes (though admittedly from the union members perspective). Then again, it's the union member being beaten, abused, maimed, assaulted and threatened. It’s rare when something that doesn’t happen makes news. But there have been few things normal about the way the T.T.C. has been running the past few weeks. Rumours were spreading all weekend that another wildcat strike was in the offing for Monday morning, potentially giving 800,000 riders a summer rerun of last week’s commuter nightmare. But the buses and streetcars rolled out as scheduled at dawn and at 6am, the subways followed, allowing many to breathe a huge sigh of relief. Members of the Amalgamated Transit Union are upset over several issues, including shift changes for some maintenance workers and the safety of operators. A female driver was scratched and spit on Sunday, when two young females attacked her over a fare dispute at Sentinel and Sheppard. She wasn’t seriously harmed but it added more fuel to the workers’ growing anger. They believe management isn’t doing enough to protect them. The union announced two weeks ago it would no longer be engaging in arguments over fare disputes. But the incidents keep occurring anyway. For now, passengers are just happy they’ll be able to get where they need to be Monday, although most admit they’re growing tired of the uncertainty. “I think we could have more options, like another company that could do the transportation as well as the T.T.C,” ventures Branca Franco. John Serraville puts up with the disruptions because public transit basically works well for him most of the time. T.T.C. managers showed up for work at 4am just in case there was another disruption. The city claims it had contingency plans in place in the event of a second walkout. Last week, Commission brass were forced to get two rulings from the Labour Board before the disgruntled workers returned. Failure to obey such an order carries stiff penalties, including big fines for employees and the union. Are we teetering on the brink of another illegal walkout by TTC workers? Given the tense state of labour-management relations, anything is possible, say those close to the talks. "Until we actually resolve some of the disputes underlying labour-management relations, we're going to have the potential for employees to be disgruntled," says TTC vice-chairman Adam Giambrone. "When employees are extremely disgruntled, it leads to issues like illegal walkouts." Giambrone was reacting yesterday to rumours Sunday night that TTC workers were going to walk out again, one week after they shut down the system to highlight labour sore points like shift reassignments, pay loss due to sick leave and driver assaults. None of the issues have been resolved, but both sides are talking. "The last week has been a very difficult week,' said Giambrone. "I can't tell you how committed they were to breaking the law a second time. I know there was a threat there. I know we spoke over the weekend. What happened (Sunday) night, we were able to eliminate the possibility. How far it would have got? I just can't answer that." President Bob Kinnear, president of Amalgamated Transit Union Local 113, was in Saskatoon yesterday attending a union conference. His right-hand man on the executive-board, Frank Grimaldi, was handling on-going talks with chairman Howard Moscoe. "The union is not commenting," said Bill Reno, the union's communications adviser. The wildcat brought traffic chaos to the city by forcing 700,000 commuters to find alternate ways to work and school. It also resulted in two back-to-work orders and the promise of a lawsuit by the TTC against the union to collect $3 million in lost fares. There was a lot of speculation, rumour and innuendo about how close things got to another wildcat Sunday night. "A lot of credit needs to go to people like the mayor and the chair of the Toronto Transit Commission who spent the weekend making sure there wasn't an illegal strike," said Giambrone. "The mayor and the chair and myself worked through the weekend to make sure disputes were being resolved." However, Toronto Mayor David Miller told reporters yesterday he wasn't involved in any discussions on the weekend to prevent a job action. His remarks seemed somewhat at odds with Giambrone's. When pressed on Giambrone's statement Miller admitted he did speak to the TTC chair. "I did speak to chair Moscoe (Sunday) but I've been entirely focused on the events of Friday with respect to public safety," said Miller, speaking of the fire at Dupont station. Miller says he didn't believe a second wildcat strike by TTC workers was ever a real possibility after the Ontario Labour Relations Board issued two back-to-work orders. "There were rumours, but rumours can be false,'' Miller said. Giambrone said he doubts events would boil over into another wildcat strike as long as management and the union continue to talk about solutions to thorny issues. "It comes down to communication between labour and management," said Giambrone. "Our job as a commission is to improve relations between labour and management. "That's how you get to an illegal strike. You get to a point where people are very frustrated. We don't condone a strike. It's illegal and it inconvenienced 700,000 people. ``At the same time we're looking at ways to improve labour relations. It doesn't serve anyone. We can penalize people. We can take them to court, but at the end of the day when you have illegal walkouts, it means 700,000 people don't get to work." There was no word yesterday from the TTC about how many passengers sought their $4 refund for last Monday's wildcat strike. Those with Week 22 weekly passes and May monthly passes may present the passes at a ticket office for the $4. The public address system is also reminding TTC patrons of their right to a refund for non-service. Just don't move the bus. No words need to be exchanged - system-wide TTC operator compliance for passengers not paying the fare - simply don't move the vehicle. When I was driving and someone didn't pay - I would just sit and wait. Wait for them to get off, wait for someone to say, "why aren't you moving" to this I would point out the person who didn't pay. Then the rest of the people on the bus would get on the fare evador's case.